A simple way to contain a spill and prevent it from spreading. Composed of lightweight, absorbent particles that encapsulate spilled liquids. Absorbs up to 10 times its weight in liquid. Designed for use on household spills and pet accidents. Non-toxic. Easy to use. Vacuums up easily after it has completely dried. Woolsafe approved. Accelerator Premium Detergent Booster has a unique property that increases the cleaning strength of any liquid or powder detergents. Enhances the performance of carpet, upholstery, and wall cleaning detergents to increase their power in removing stains, cleaning, and revitalizing the true color of fibers. 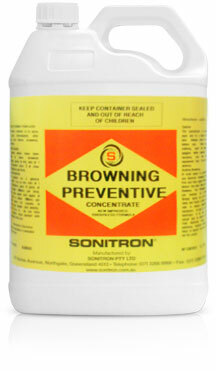 Sonitron Browning Preventive is an extremely versatile and effective fabric sour. It reduces or eliminates the occurrence of cellulosic browning it may be used wherever an acidic conditioner is desired before, during or after cleaning. It may be applied through your extraction equipment as an acid rinse. A product to remove cellulosic browning of carpets rapidly and economically even on large areas by use through the extraction machine. Can also be used as a stain remover, particularly on brown stains of vegetable origin such as tea and coffee. Forms one part of our 2 pack system for removal of cordial stains. 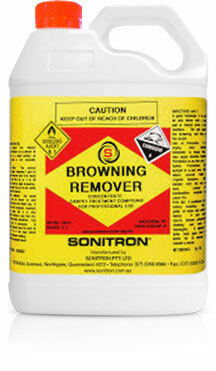 Removes cellulose browning from carpet and upholstery. A premium spotter for removing coffee, tea, tannin, and specialty stains. Formulated to react specifically with these stains to effectively remove or modify the discoloration. Even old, stubborn coffee stains will be reduced in intensity. Also effective in reducing appearance of urine stains and water marks. 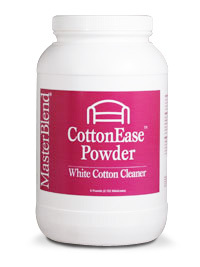 Premium formula white cotton cleaner for all Haitian, Tahitian, and other raw cotton fabrics. Dirt Chaser is a moderate pH enzyme pre-spray/spotter. Dirt Chaser competes with high pH products and can also be used as a protein spotter. A revolutionary product for setting fugitive dyes on wet cleanable textiles such as upholstery and rugs. & get our latest offers delivered to your inbox!